The first elk tag I received in my home state of Nevada came well after I started elk hunting. Ten years later to be exact. By that point I had shot quite a few bulls myself in other states and guided to many more while working as an elk guide in Montana and New Mexico. Most the bulls I had spotted while glassing, but most were probably a mile away or less. On that first hunt in eastern Nevada, I changed up my tactics a bit. Not really knowing where I wanted to go, and arriving at the tail end of my season, I gave the area an overview from afar. At around 5 miles away from the mountain where I would be hunting, my dad, mom, and I set up our spotting scopes and started glassing. It did not take long before we were able to pick up a bull worth getting a closer look at. Before that, five miles seemed like an extreme distance to be glassing for elk. Over the years I have found, sometimes you just need to step back to see the whole picture. The further you get from the, the more of it you can see. This can be really beneficial, especially in a new area. Glassing bulls from a long or extreme distance can give you a view of a lot of country, but translating that into success is a whole other story. This article is intended to provide tips on how to cover the most area while glassing from the distances of four up to ten miles away, and focus in on how to close that long distance and be successful. Spotting the elk is one thing; figuring out how to get to where the elk are, and pinpointing their exact location is where the real challenge is. Deciding what to do once they disappear into cover when you are so far out and when you should make your move are the tactics that will make glassing from a long distance successful. I am a firm believer that quality optics have changed the landscape for western hunters dramatically. I definitely think that over the years, the topic of glassing has been well covered, extensively talked about, and almost beaten to death. The reason is because it is that important to know. When it comes to elk and modern optics, either a spotting scope or binos, how far is too far away to glass from? One mile, three miles, five miles, fifteen miles? There have been many times I have spotted elk 5 to 10 miles from where I was glassing. The hard part is not just spotting the animals, but how to make a move once an animal is spotted at extreme distance. There is a lot of ground to cover and a lot that can make this tactic fall short. Looking for ants – tips for picking out elk really far away. Start early and systematic: When looking at these distances even on a high magnification the elk will appear tiny in the scope. They can also be nearly impossible to pick out in cover. That is why when you are looking over a long distance you want to be ready early. Glassing anything from four miles or more can be tough so your best bet is to catch the elk while they are out in highly visible spots or moving. It is important to be at a good vantage before daylight. You will get the most time to catch the elk in their routine and actually be able to see them. As the area starts to get light enough to see, start by quickly glassing all the obvious openings, meadows, or feeding areas. These are places where an animal would be obvious to see in the grey light, also places where elk may like to be first thing. I give them a quick initial once over that way I don’t miss anything that might just be standing out in the open. Next give the entire area a once over. This is generally with binos or the scope on low magnification. You will not only be rescanning the most likely areas but be looking over a large area to once again make sure there is nothing blatantly visible. After this initial once over, I switch my focus to a more detailed look. I generally start out looking east if I can. That way I can cover the area the sun will blind me out of first. If there is an opportunity to look west I will save it because the elk will stand out a lot easier once the sun hits them. I like to glass in this pattern to try and cover the majority of my vantage by factoring in the sun. The distance I am from the mountain depends on the method with which I glass. I start zoomed out in the spotting scope. I will use my hood or an extra jacket to cover my head blacking out the surrounding light from the eye not looking through the scope. This allows me to comfortably glass for an extended period of time with better focus and less fatigue while having both eyes open. While glassing, leave the scope stationary and scan the available area with your eyes through the optics. Study it for a while before moving the scope to a new spot. Patience and continually watching the most likely elk spots may help you catch them while they are visible. Spotting from extreme distances can be more about locating a location to focus in on than anything else. Keep in mind there may be clues to hone in on. One major clue is to look for tracks across snow fields or in the open. You can actually pick up game trails and spot tracked out areas pretty well from a distance. These are all good things to look for and often stand out easier from afar. Analyze what you see: Once you spot an elk, the hardest part is identifying whether the elk is one you want to go after or not. Often you may spot an elk but it can be too far to really see the characteristics of the antlers. In this scenario, I use indicators of color, shape, relative body size, and behavior to determine if it warrants a closer look. From a distance the blond body is the first indicator, I combine that with looking for a much darker neck area and square body shape. At distances where it can be hard to see all the antlers but you can make out an outline, I have found that you can still estimate maturity of the animal by gauging their overall body shape. Mature bulls tend to look square. This is because as they age the chest barrels down. Also, the contrast of the dark neck to a whiter body helps determine maturity. In most areas, elk with these features will get me moving to take a closer look. Looking at behavior is also a good way to help determine the maturity level of an animal. Take in the factors of the time of year and what else is around. During the early fall, the mature bulls run the herd. Ask yourself if the animal you are looking at in on the outskirts of the herd or is he doing the chasing? Later in the year, mature bulls are often alone or in small bachelor groups. Is the bull you are looking at with a bunch of cows? Or is he sitting on a remote point alone? Now that you have an animal spotted what next? Picking an elk up a long way away is one thing, but translating that into success is another ball game. This is where planning, navigating, and strategy enter into the hunt. Strategy: The main strategy when hunting bulls at distance is to watch what they do in the morning, and then take the day to get into position to hunt them in the evening. This is the most successful plan to make long distance glassing pay off. I will often watch the elk until they disappear or bed. The key is to move in during the day and pick a spot where you can either watch from a relative proximity to where the elk disappeared, or just set up where you believe they are going to come out again. I this tactic is extremely successful but you want to refrain from tromping through the thick cover where they are bedding. The best play is to get to where they were last seen feeding in the morning and wait there for them to come back out before sundown. Going in after bedded elk in thick cover rarely pans out. Depending on the hunter pressure in the area and your certainty of where they will come out will determine how you set up for the evening. If there is a lot of pressure the elk generally won’t come out to feed until just before shooting time ends. This means you will want to position yourself within range of the best place to catch them when they first come out. If there is a large area to cover and you are not sure where they will feed out to, I suggest getting a close vantage where you can glass, but still have time to make a stalk and get into position. Over the years this method of spotting elk from afar in the mornings then getting set up in the evening has been successful more times than not, even across multiple states and types of terrain. It is especially effective in places where there are only limited feeding areas surrounded by heavy cover. In order to make all this come together, you need to make a solid plan before you even leave your glassing vantage. There is still a lot of turf between you and the bull. Planning and navigating: The first step of the plan is to determine the location of the elk. If you are familiar with the area you are looking over, you are already ahead of the game. This can be instant knowledge, but this is not always possible. 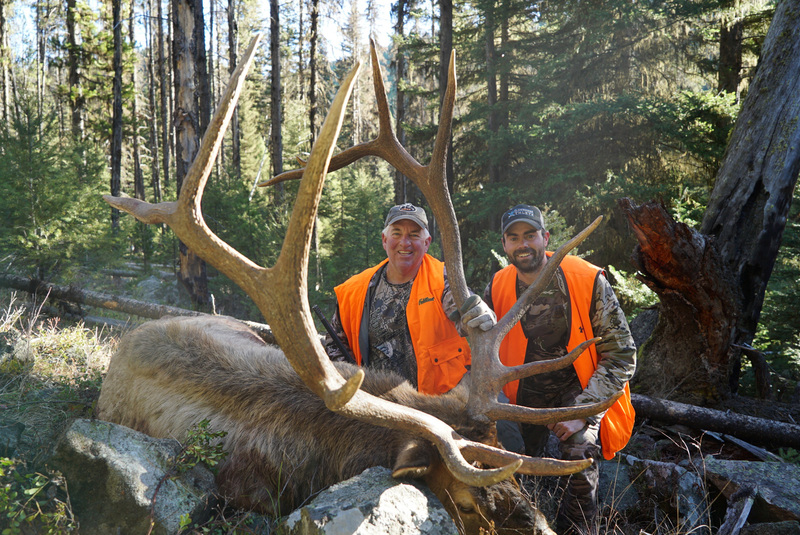 On most hunts, the place you spot an elk a long way out may be somewhere you have never been. You will have to use the tools available to get you to the right spot. I will start by documenting where I am looking by taking a few photos with my phone or camera. I will take a couple through the scope in a zoomed-in view trying to capture the animals and any distinguishing features. I will then take a few more photos from partially zoomed-in (not through the scope) to zoomed all the way out. These photos I will use as a reference not only in the planning but later as I navigate toward the bull’s location. I will note any landmarks and various ridges or draws and estimated distances from these landmarks to where I want to be. I will also plan not only where the elk are, but possible locations I will be able to see that same spot from at a closer distance. I will next pinpoint on a map exactly where the animals are. I have found that paper maps work great but even offline Google Earth maps will give you a serious advantage. I think it is important to have a topo view as well as aerial view if possible. This will allow you to switch back and forth to get an exact location. Recently I have found that the Onxmap app can be one of the best ways to pinpoint where exactly you are going. Technologies like that allow the hunter an uncanny ability to pinpoint exactly where they are looking by combining multiple map types in a single map including topo and aerial. This is the point where you will want to plan out not only where you are going but how you plan on getting there. Factor in where the wind might be, and the best possible route. Look for roads or trails that may be the best path in. Keep in mind that the best way may not be a straight line. There have been many times where I just started walking toward where the elk were in the distance, only to get over there and find a much easier route if I had spent the time to analyze and plan it out. Once you have the plan, plot the course. Use both the map you have and the image reference from the photos you took to get into place. Using the photos from your original view is a great asset to reference when everything starts to look different. Keep in mind that when you are planning your navigation that the best way may not always be the easiest. Last season I spotted a bull three miles out. The obvious path was to head across the canyon. The best route, however, looked to be coming in from the other side. This in total would be too far to walk in time to set up. Instead, I opted to walk the three miles back to the truck, drive around the mountain and approach from a mile away (the better position). It paid off. I got in on the elk and in not much more time than heading straight in. It was slightly more walking but was beneficial. Glassing elk from a long distance can be an extremely effective way to find elk, especially in a new area. Spotting them in the morning and using the day to cover ground and get set up for the evening is a great way to be successful. Especially with modern navigation tools, getting to that spot way off in the distance can now be done with pinpoint accuracy, giving the hunter the upper hand. When looking at a mountain off in the distance, instead of ignoring it, sit down, pull out your optics and study it. You may be surprised at what you have been missing in those spots that almost seem too far away. Glass with both eyes open but try to black out the eye off the scope with a jacket or your jacket hood. Continually check the best spots. Just because elk are not there when you first looked does not mean they won’t be. Sometimes they just need to get into a more obvious position so give it time. Never forget to look close as well. When you are focusing in long way out with the scope, look away for a few minutes with your eyes and binos. The Trick-Pin System: Quit your Rangefinder Habit!